Balthier rose up from the chair he had been sitting in. Almost a year since the journey had ended and still, he felt he had more to come, but that didn't matter now. He'd come home for one reason and one reason only, and that reason was wriggling in his arms. "Have you named him yet?" he asked his sleepy lover on their bed. She smiled and shook her head. "I was waiting for you. You haven't been home a lot so we didn't to pick out a name." He moved over to the bed and set the squirming infant in her arms. Kissing her, he began to softly stroke the baby's hair. "He's beautiful," he murmered in complete awe. His lover gave a soft laugh. "Glad you approve of him." Balthier nodded, not really hearing her words. He couldn't help it. He was in silent prayer for protection over his new child. It was obvious he could protect the child to the best of his ability, but what if he got into trouble and Balthier himself was on one of those missions people loved giving him. Balthier looked back at the form of his sleeping son in Fran's arms and sighed. The hardest part of pirating, that was what this was. Knowing from the very first time they had found out, that children would not be able to ride with them, nor could they settle down and just take care of him; that was even more dangerous with the price that was on their heads. The man continued to watch the child, unsure of what to do next. He wanted this child. He really did, but what would he have done if he did raise the child and had to watch it die? Or vice-versa? That couldn't happen; he himself knew what it was like, to have to watch your father die, unable to do anything but watch. 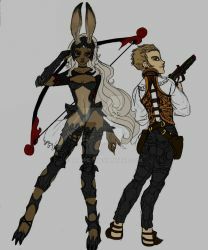 The purpose of this club is for you, the Balthier x Fran fan, to have a place to come and support the pairing. 1. Must be a fan of Balthier and Fran, either as friends or a romantic relationship. Fuuu Balthier and Fran are my fave pairing squeeeee <3 GREAT PAGE!! i love this couple even tough i never played FF12 yet and i'd like to join. I will join One of the best couples in Final Fantasy.